The Charge Station™ was founded by Olga S. Pérez based on one focus — Happiness. What began as a desire to help close friends optimize the quality of their lives has grown into a lifelong mission to give all individuals the tools they need to turn their lives around. Her breakthrough system combines social networking and life strategies for cutting edge results. 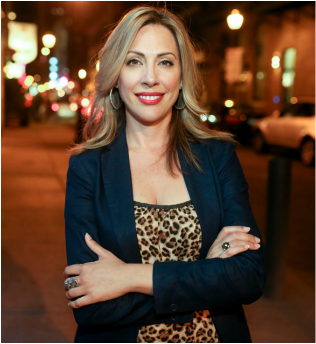 Her unique approach takes happy hour to a higher level by empowering like-minded individuals with the tools provided by guest speakers, organizations, and businesses that empower each other. For over two decades, Olga has empowered individuals to achieve their highest self. As a highly respected authority on the psychology of self-love, she has developed strategies for personal and professional transformation and for promoting positive energy. She has advised and counseled people from every walk of life—business leaders, parents, celebrities, and artists. Olga has directly influenced the lives of many people from all over the world, through her writings, broadcast media appearances, public speaking engagements, live events, and one-on-one coaching sessions. Olga is internationally educated. She has launched two successful business ventures, has won numerous awards and accolades, and has donated thousands of hours volunteering for individuals, corporations, and foundations. As a sought-after keynote speaker, Olga translates life into fun and relatable analogies, inspiring confidence and leaving participants eager to apply what they’ve learned. "The integrity I see in [Olga] is why I trust her and why I know she will help many people as she has helped me." "Ask yourself if you are ready for the truth. If the answer is yes, then talk to Olga. "The hardest part about communication is choosing the level of honesty. When I think about Olga, I think of the person I can tell anything to without feeling judged." "I am truly blessed to have her in my life. Olga is always there when I need her. I thank her for believing in me and giving me the right tools to fight for what I want and for giving me the ability to change my life completely. I could not have done it without her. I am so thankful!"